San Diego Source > Special Reports > Today's strict energy code: What options do you have? Today's strict energy code: What options do you have? It is hard to imagine now, but until 1978, buildings were not even insulated! It was the Arab oil embargo and long gas lines of 1973 that changed people's minds and triggered new policies to stop wasting so much energy. Title 24 building energy codes have been law in California for more than three decades, and all other states now have strict energy codes also. A national leader in energy policy, California has strongly proven that economic growth does not require equivalent growth in energy consumption. In fact, buildings often have improved financial performance when they are designed and operated more efficiently. Climate change is breathing down our necks: hurling more frequent and stronger hurricanes, setting the stage for many more wildfires, shrinking our snowpack and reservoirs, expanding the seas encroaching on our shores, and threatening very expensive infrastructure. We finally must face what we had wanted to avoid. Greenhouse gas emissions must stop going up and then they must come back down. The California Climate Change Scoping Plan outlines the goals and stricter energy codes are one of its many strategies. In the past, energy code updates mostly codified what had already become fairly standard building practices. Now, instead of lagging standard practice, the energy codes are leading. The current Title 24-2013 energy code is by far the most ambitious to date. But even this is just an interim step. By 2020 all new residential construction must be Zero Net Energy, and by 2030 all new commercial construction must be Zero Net Energy. Additionally, by 2030 our existing building stock must reduce its energy use by half. Because past code requirements had been close to then current practice, owners, architects, and builders didn't have to pay too much attention. Their typical mechanical and electrical design engineers could quietly keep them out of trouble. However, with the codes and the market moving towards annual Zero Net Energy, those days are over. To maintain design options and manage construction costs, significant energy expertise and early attention will be required from now on. There are two paths to energy compliance. How do you choose which one is right for your project? If you prefer fewer decisions, then choose the Prescriptive Method. If you want options for features like glazing and solar water heating for multi-family, then you must choose the Performance Method. 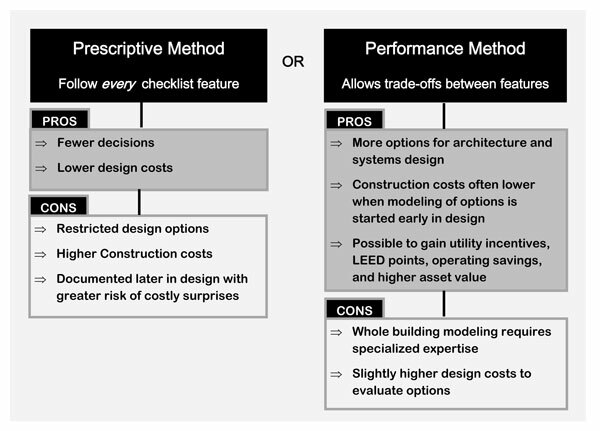 You may want a summary of the Prescriptive requirements for one project and a reliable Whole Building Performance energy model for another. * develop an Energy Master Plan. The premier energy modeling team at Brummitt Energy is ready to help.